The growth of the advanced stats crowd within the hockey community is undeniable. Terms like Corsi, PDO and Fenwick are used almost as regularly as goals, saves and assists. Player performances are now analyzed using a different set of metrics with traits formerly viewed as important now considered either a negative or unimportant reflection of the player’s usefulness. 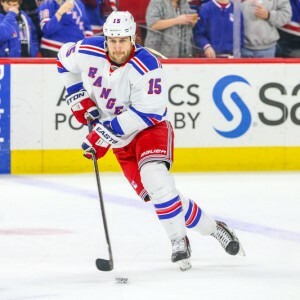 One player who generates much discussion and debate between the “traditionalists” and the advanced stats crew is Rangers LW Tanner Glass. Advanced stats suggest Glass is a liability to his team, a possession black hole. In terms of Corsi, Glass placed 350th of 360 forwards who appeared in at least 500 5v5 minutes this season in Corsi For % (CF%) at 42.58%. Puck possession results in more quality scoring chances for and fewer quality scoring chances against. This is borne out by Glass’ ranking of 326th in High Danger Scoring Chances For % (HSCF%) with a 43.94%. This essentially represents the advanced stats case against Glass: His team doesn’t have the puck and allows far more dangerous scoring opportunities when he is on the ice. Worse yet, according to these numbers, nearly every Rangers teammate performed better in terms of puck possession when not on the ice with Glass than when they skated with the rugged forward. As an example, Dominic Moore, Glass’ regular pivot on the 4th line, finished with a Corsi For % five points better when he was not with Glass. Nonetheless, despite those metrics, head coach Alain Vigneault saw enough value in what Glass did for the Rangers to dress him for 57 regular season contests and four of the club’s five postseason games. Vigneault isn’t wholly ignorant of advanced stats concepts. When he arrived in New York he spoke about using metrics to determine the best possible on-ice matchups and zone start positions for his top players. During his tenure with the club he has also mentioned possession ratios suggesting that while the club may not track possession using shot attempts, they may measure time of possession. It stands to reason Vigneault is aware of Glass’ struggles in the puck possession department so then why did he continue to send him over the boards this season? Glass is known as an “energy” player, someone who forechecks hard and on occasion, is willing to drop the gloves. He ranked 5th in the league among players with a minimum of 50 appearances with 3.9 Hits/GP. Hits is a category that draws differing opinions as to its actual worth on the ice. Yes, forechecking forwards can wear down defenders by playing the body with regularity. They can also force turnovers by showing a willingness to throw a hit. Then again, if you are in a position to finish a body check it means your team is chasing the puck and that isn’t a good thing. While I am unaware of any official studies on the subject, a quick look at NHL.com’s real time stats for the last three seasons show that of the 45 teams to finish in the top half of the league in the hits category, just more than half, 23, qualified for the postseason. That doesn’t prove anything, of course, but it at least suggests there is little or no correlation between on-ice success and a team’s proclivity for hitting. Carrying it further, of the top-10 during the regular season in hits over each of the previous three campaigns (30 clubs), just 10 teams also placed in the top-10 in takeaways. That suggests there is a limited relationship between hits and takeaways. Additionally, of those 10 clubs, only two also ranked among the top 10 teams in puck possession according to Corsi. So, hits don’t necessarily result in takeaways and takeaways don’t lead to sustained puck possession. Now real time stats are recorded at the game by the league’s official scorekeepers. Each scorekeeper likely has a different standard or interpretation as to what constitutes a takeaway than perhaps versus a giveaway. Shots on goal are known to be more generously awarded in some arenas than at others. That’s the nature of the beast: A margin of error should be assigned to information accumulated by humans. One trait that simply cannot be quantified by advanced stats is team chemistry. In fact, statistical analysts generally feel there is little proof that team chemistry plays any role in the success or failure of a club. But if you talk to the athletes and coaches it’s a different story. How often in interviews do hockey players and/or their coaches reference a big hit or a fight as generating energy and a momentum swing in their favor? His teammates do appreciate the role Glass plays and feel he adds value to the team when he plays. That’s essentially what this argument boils down to. The advanced stats crowd will point out that Glass is a liability in every metric that matters: Goal scoring, goal prevention and puck possession. But the traditionalists will cite the unmeasurable qualities, the value of which can neither be proven nor disproven. Who is right? That depends on who you are and which side of the argument you reside.